It is our pleasure to introduce you to the latest news about Japanese bamboo baskets for basket lovers and art enthusiasts. NEW!! Mr.Norio Takeuchi has published a new book. Feeling the flow of the season and a life with flowers. 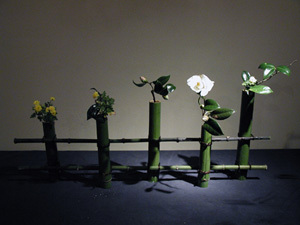 Mr.Norio Takeuchi has been demonstrating and exhibiting ikebana at Hanabako for some time. 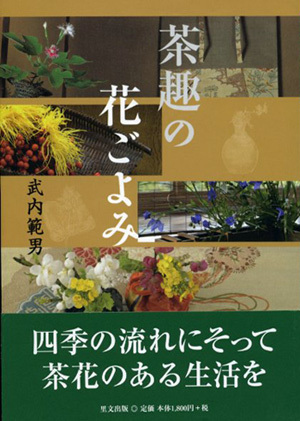 He has published a wonderful book of seasonal flowers in tea ceremony ikebana. You may look for more information here at amazon. Please look at our past exhibitions also. On May 17th, 2009, CBS news "SUNDAY MORNING" reported on japanese bamboo art and some artists and their works were on air. 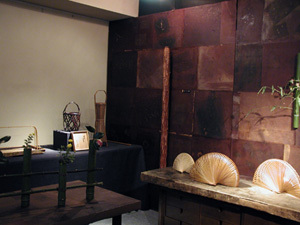 The works shown can be found at Hanabako. If you are interested, please contact. For artist information, click here. There are no box to this work. A bamboo vase is included. A very thin bamboo, about 1mm, weaved in hexagon shape in mesh. It is light and delicate. The shape of the basket is like a ship or a moon, which shows the quality of this artist's high technique. Shokosai 3rd named this work as this is the work of Shokosai 1st on the year 1914. On sale in book stores in U.S. and Japan. 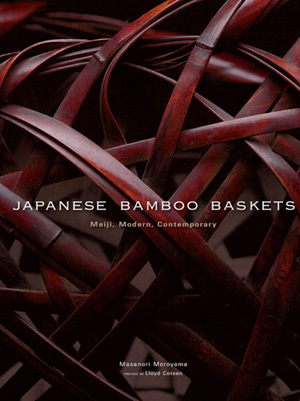 "The captivating pieces in this volume chart the evolution of the Japanese bamboo basket. From the Meiji Period (1868-1912), a string of talented craftsmen designed elegant works for connoisseurs of the arts, who sought more polished pieces to meet their changing vision of a cultured lifestyle. The next generation of Modern craftspeople refined the vision, taking it to new heights of sophistication. Today, the Contemporary bamboo artist continues to innovate, creating bolder works with a growing arsenal of expressie techniques--and elevating the genre to the world stage." "The first book to introduce the full range of Japanese basketry both traditional and contemporary with stunning color photography and commentary by two noted experts. Also includes a history, interviews with renowned basketry artists, and a visual glossary of weaving techniques." A beautiful book of full colored photographs of bamboo works, which shows the most tasting part of the astonishing techniques and beauty. The photographs has done its best with the light and shadow of the delicate weaves of these baskets. It is a book worth looking through. Masanori Moroyama is a chief researcher of the National Museum Of Modern Art, Tokyo, and Lloyd Cotsen is the one who have introduced the Japanese bamboo basket in the United States. 9 x 12 in. 160pgs. 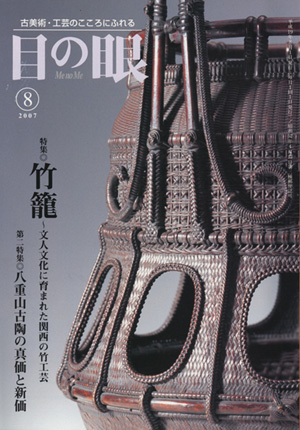 The August issue of the Japanese art magazine Me no Me was a special issue on bamboo baskets, where Norio Takeuchi, the senior curator of the Hatakeyama Memorial Museum of Fine Art, and Masami Oguchi, the owner of Hanabako gallery, talk about how the art of the Japanese bamboo basket was born and how it was raised to a higher level. Bamboo art has been established in four areas ﾑ Oita Prefecture, Kansai (Kyoto, Osaka, and Kobe), Tokyo, and Tochigi Prefecture. Each has its own historical background and thus its own tradition and techniques. Also in this issue, Tanabe Chikuunsai III and his son Shochiku write about the family tradition of Chikuunsai bamboo art and the history of Sakai City, Osaka, where they are from. The city was one of the leading cultural centers for centuries, where flower arrangement, tea ceremony, and other art-related activities were practiced. 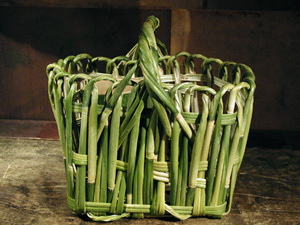 Bamboo baskets needed to be "sophisticated and stylized" as they were an important element in flower arrangement and the tea ceremony even before the premodern period. Chikuunsai III and Shochiku introduce interesting stories about how Chikuunsai I and Chikuunsai II adapted the tradition of the city for their art. In addition, they introduce pieces by the students of Chikuunsai family that will not be exhibited at The Art of the Chikuunsai Family at Hanabako gallery from July 19 to August 1, 2007. Full colored 31 photographs included. The August issue of Me no Me magazine is available at Hanabako gallery. This aodake bamboo basket, fit for luner new years, is made by bamboo artist, Ichiro Tsujimura, living in Kanagawa. This is a copy of a masterpiece, "Magaki" by Rokansai Iizuka. Although it is a copy, Mr.Tsujimura has shown his essence and made it into a pure and strong work, which is from his long experience with aodake. I have placed a red and white camellia to strengthen the aodake color. Thanks to Mr. Tsujimura who have let me arrange flowers in his basket. Mr.Tsujimura talked about Rokansai and said, "Rokansai must have made aodake baskets". Surely, Rokansai has said for himself about tea basket that, "In new years, aodake cut into a vase or aodake are pleasured at tea." Of course, there is no way a green basket can exist until this time, but I have never thought about him using aodake. Probably, there are not much people who has thought about this. As a researcher of Rokansai and an artist dealeing with bamboo that hi is, this is Mr. Tsujimura's unique view. The work, "Magaki" on Rokansai Catalogue (published by Tochigi Museum, 1989) was not made of aodake, but the process of how Mr. Tsujimura's work will change through out time is worth seeing. In the "Chya (Japanese Tea)" world, "Aodakes"(raw bamboos that are not dried or lacquered) are used in New Years. These pictures are some examples we have used to decorate our gallery. "Aodakes" are used as vase to arrange flowers, tea lid holder, or Chyasaji (tea spoon used for tea powder). 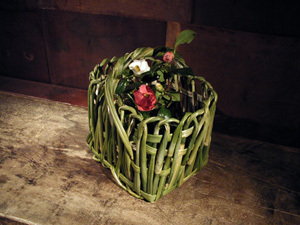 Hanabako is exhibiting "Aodake" vase and basket made by artist, Mr.Ichiro Tsujimura. "Aodake vase with bamboo leaf" and "Aodake in Byobu style" is both made by Mr. Tsujimura. He has gone looking for the best bamboos for this work on the 3rd of January. 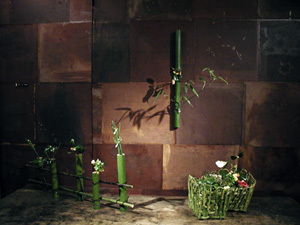 Since "Aodakes" are raw bamboos, it will dry and become brown. You can avoid that by pouring lots of new water and spraying water. It can last green for about 2 weeks by doing this. middle: "Aodake vase with bamboo leaf"
Soho Katsushiro was recognized as Human National Treasure on July, 2005. As a bamboo artist, he is the 5th recognition in Japan, followed by Shono Shounsai (1967), Iizuka Shoukansai (1982), Maeda Chikuhousai 2nd (1995), Hayakawa Shokosai 5th(2003). In May this year, in favor of Mr. Katsushiro, I was able to visit his home in Ootawara city of Tochigi prefecture to see many of his works and fortunately to talk about many things with him. I would like to write a little about this. Mr. Katsushiro Soho was born on February 23rd, 1934 in Kuroiso city (Nasushiobara-city) of Tochigi prefecture. After he learned the basic skills from bamboo artists, Yagisawa Keizo and Saito --, he teached himself the advanced traditional techniques. Furthermore, he invented new weaving techniques, such as "Nadeshiko (Yose-ami)" and "Kikyo (Yose-ami)" and uses them to make works with contemporary features in them. After he has been accepted for the 7th New Works of Traditional Articraft Exhibition, he has been accepted to many articraft exhibitions every year and has been awarded many prizes. He has also been awarded the "Shijyuhosho", an award given to one who has made considerable achievement in regard to his/her invention, improvement, and creation in science and art. His family work is farming, and lives in an invironment surrounded by rice fields and farm fields and the green mountains. From the invironment he lives in, his works show the grand blessing or the instant glitter of nature, where you can feel the atmosphere of sublimity beyond human knowledge. There are works named after the inspiration of nature, such as "Sazanami (rippling waves)", "Keiryu (mountain stream)", "Semishigure (chorus of cicadas)", or "Akatsukigumo (clouds of dawn)". Mr.Katsushiro is a natural, spontaneous man, who speaks calmly with a Tochigi intonation. But once it comes to his works, he tackles with a spirit of challeng. He says that he is always trying to invent a new way of weaving to express his image in himself. The beauty of Japanese baskets are in the lines of bamboos, when they are made most use of it and the play in it -- this is what his philosophy of making baskets is based on. He does not intend to show detailed techniques, but to express his idea into image unrestricted from the whole wor! k itself. He says that he has enjoyed working with each of his works. It came to me that it would be a good idea for young people to make contact with his constructive spirit of working. It was a heartwarming to see Mr.Katsushiro's grandchildren come by to say hello politely, as they came home from school. His composure behind his works seems to come from his loved family and his loved wife. I would like to congratulate sincerely to Mr.Katsushiro's recognition of Human National Treasure. Moreover, Hanabako has been given an opportunity to exhibit Mr. Katsushiro's works at the tea room of Hatayama Memorial on October 15th and 16th. Please take a chance to come see this exhibition. Many contemporary bamboo art works has arrived! Copyright(c) Hanabako.com All Rights Reserved.